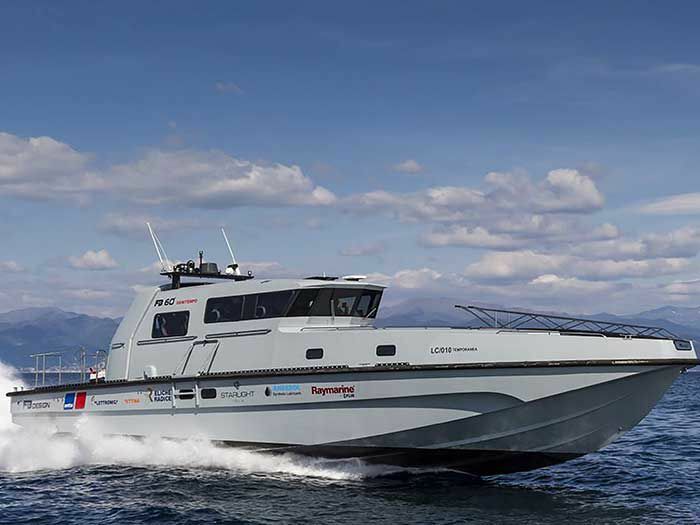 The SAR 60, an 18 m high-speed search and rescue vessel prototype, set a new "Round Italy" record, July 12, completing the nearly 1,120 nautical mile voyage from Montecarlo to Venice in 22 hours, 5 minutes and 42 seconds, at an average speed of 52.3 knots. The 18 meter boat was piloted by its designer, Fabio Buzzi, and built in his Annone Brianza, Italy, FB Design shipyard. The boat, which has a near 60 knots top speed is powered by two 1,600 HP MTU 10V 2000M94 engines equipped with an additional "rough sea kit" that enables safe operation in the most extreme conditions. MTU technical experts were on board the boat throughout the journey. MTU is a Rolls-Royce Power System brand. The SAR 60 is designed for military missions, primarily rescue and maritime control. "We always try to test our boats to the limits before selling them to clients and this record attempt was our way of demonstrating the capabilities of this new lifeboat design," said Mr. Buzzi. Stefano Gibelli, MTU Italia, Technical Director, commented: "The MTU 2000 engines performed perfectly from beginning to end, demonstrating again their superiority even for prolonged high-speed missions. Operating for 22 hours at full speed, with just one fuel stop, testifies the fuel efficiency of the engines." The record attempt began on Monday July 11, at 9:52:47 AM from Montecarlo with only one refueling in Calabria, at Porto delle Grazie of Roccella Jonica, located exactly midway on the route, and ended on Tuesday 12 at 7:58:30 AM at the Lido of Venice, experiencing a very rough sea in the last 100 miles of the northern Adriatic. That's not all. On the same route and on the same day, another FB Design boat, the smaller FB 32, powered by two VM Italian engines of 350 hp, left Montecarlo. It also refueled in Roccella Jonica, arriving in Venice after 32 hours 46 minutes and 15 seconds, setting a new record in the up to 9 meter junior class with an average speed of 35.26 knots (65.38 km/h). Like the SAR 60, the FB 32 is intended for military use, the military market now being FB Design's largest, though the yard still makes the fast racing boats that were its original market when founded by Mr.Buzzi in 1971. In the last 15 years, FB Design has developed a full range of military boats, in use by military and Coast Guard organizations worldwide, and incorporating an impressive series of patents, related to hulls, drives, propellers, gearboxes, waterjets and gas turbines.